Happy post Superbowl Sunday! If you are a Denver fan congratulations on that win. If you are like me, and only show up to a party for the food and drinks, congratulations on that win as well. Now let’s get to some “eggciting” things. Eggs! As a part of my meal plan, I have to eat egg whites every morning. Egg whites and plain oatmeal. To keep things interesting, I have to make my egg whites enticing. Since breakfast is my favourite meal of the day because I am hungry when I wake up and love to break that fast, I need something nourishing and tasty to start my day. Now, I make an egg white baked frittata on Sunday that will last me through the week and will keep my taste buds happy too. I use a casserole pirex dish to make my frittata. Finely chop vegetables of your choice. In a pirex coated with a light layer of cooking oil to avoid your frittata from sticking, put your vegetables in the coated pirex. I then pour about 5 cups of egg whites into the dish and make sure the vegetables are evenly distributed throughout the liquid. A dash of sea salt and pepper come next. Place the pirex dish into the oven and let bake for approximately 30 minutes or until the eggs are solid and completely cooked. 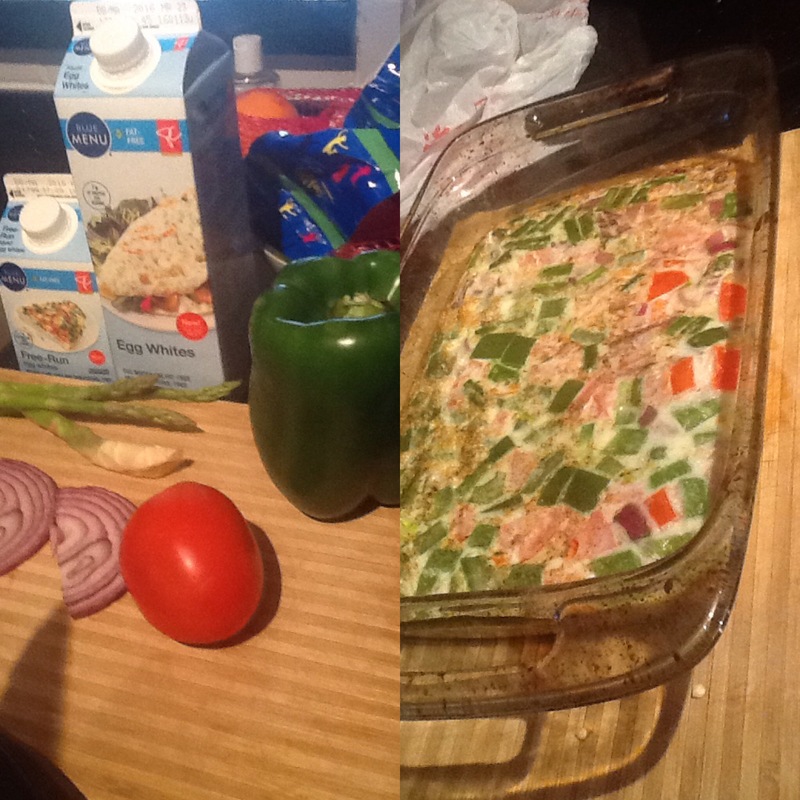 This week my vegetable combo to add to my frittata was asparagus, red onions and Roma tomatoes. And then there’s cheese. Sometimes I add a sprinkle of light cheese on top, but I use sparingly as cheese is so salty and fatty. Some cheeses I use are light mozzarella, feta or goat’s cheese. Mozzarella, broccoli and red onions is a frittata combo I really enjoy. What is your favourite way to break that fast? Any frittata or egg white recipes to share? Eggs every morning?!!! Sign me up! Any recipe with your favorite veggies and lean meat. Gotta be careful to not let the other ingredient overpower the eggs. That’s true. I tend not to add garlic to my frittata because I find it does exactly that. Yum! I eat boiled eggs like an old grandma. LOL I’ll need to make this sometime! It’s very good and versatile. So many veggie combos. I love my granny boiled eggs too! Great idea! I love this. It’s so convenient, Jenny. With so many combos. Frittata is awesome, especially the light way. I had one in Spain once and it was with potatoes and ugh, after that thing I felt so stuffed! Anyways this looks pretty awesome, I wonder if you could also make it sweet? What do you think? I love Frittata. I’ve only had it locally here at brunch events. I’m not sure about sweet ingredients. If you give it a try, let me know how it goes. Thanks for your visit, Johanna.